"What's up?" inquired the Rat, pausing in his labours. "I think it must be the field-mice," replied the Mole, with a touch of pride in his manner. "They go round carol-singing regularly at this time of the year. They're quite an institution in these parts. And they never pass me over—they come to Mole End last of all; and I used to give them hot drinks, and supper too sometimes, when I could afford it. It will be like old times to hear them again." It was a pretty sight, and a seasonable one, that met their eyes when they flung the door open. 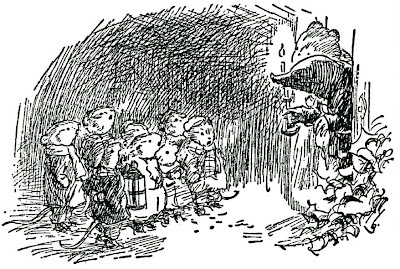 In the forecourt, lit by the dim rays of a horn lantern, some eight or ten little fieldmice stood in a semicircle, red worsted comforters round their throats, their fore-paws thrust deep into their pockets, their feet jigging for warmth. With bright beady eyes they glanced shyly at each other, sniggering a little, sniffing and applying coat-sleeves a good deal. As the door opened, one of the elder ones that carried the lantern was just saying, "Now then, one, two, three!" and forthwith their shrill little voices uprose on the air, singing one of the old-time carols that their forefathers composed in fields that were fallow and held by frost, or when snow-bound in chimney corners, and handed down to be sung in the miry streets to lamp-lit windows at Yule-time. Joy shall be theirs in the morning." "Very well sung, boys!" cried the Rat heartily. "And now come along in, all of you, and warm yourselves by the fire, and have something hot!"